When your child is sick, going to the doctor’s office isn’t always convenient or practical (somebody’s got a stomach bug). But now, kids between the ages of 3 and 17 can have an LVHN Pediatric Video Visit with one of our providers, right from the comfort of home. Pediatric video visits offer parents or legal guardians a convenient way to get non-emergency medical care for their child anywhere (within Pennsylvania) that’s convenient. You will need your own MyLVHN account and proxy access granted to your child’s MyLVHN account. Then, you can schedule – and have – a pediatric video visit for your child anytime, 24/7. “Pediatric video visits provide access to LVHN medical care for the times when your child has a minor illness, like a cold or stomach illness, or other troublesome but non-emergency medical concerns like an insect bite or rash,” says Mindy Brosious, RN, Clinical Coordinator, Air Products Center for Connected Care and Innovation at LVHN. Tip: If you can see your child’s photo on your own MyLVHN account home page, then you already have proxy access. If you don’t see your child’s photo, you will need to request proxy access at their next appointment. To schedule a video visit for your child, first log-into your own MyLVHN account and then click on your child’s photo. From there, select the Schedule an Appointment or Schedule a Video Visit icon in your child’s account and complete needed information. Appointments are available all day and all night. LVHN Pediatric Video Visits are not just convenient, they also help ensure your child’s health care information is available during and after the visit. During the visit, important health information from your child’s medical record – including allergies, current prescriptions or recent medical visits – will be available to the doctor or advanced practice clinician who conducts the video visit. Then after the video visit, the medical record is updated. “All information about the appointment will be added to your child’s medical record, so if you need to follow up with your child’s primary care provider, he or she will know about the care and recommended treatment,” Brosious says. You can learn more by reviewing LVHN Pediatric Video Visits: Frequently Asked Questions, including the list of all minor illnesses or injuries that are appropriate for a pediatric video visit, more information about proxy access and technical questions. 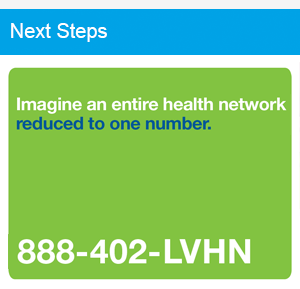 LVHN Pediatric Video Visits cost $49, and may be covered by your health insurance plan. Check with your insurance company to understand your coverage.